I was given the awesome opportunity to review Duck Tape from Shoplet.com. I wasn't sure what would be coming in the mail but was happy with my surprise package. For those that are not familiar with Shoplet.com they carry all the office supplies you could ever need! In my surprise package I was sent three wonderful Duck Tape products. The large pack is the Duck EZ Start Premium Packaging Tape this comes with three rolls of very easy to use and tear packaging tape. The tape itself was just sticky enough to hold up very well. It was nice to use a packaging tape that actually worked the way it claimed to do, other packaging tapes I have used in the past have been so frustrating and I couldn't understand why they would always tear! 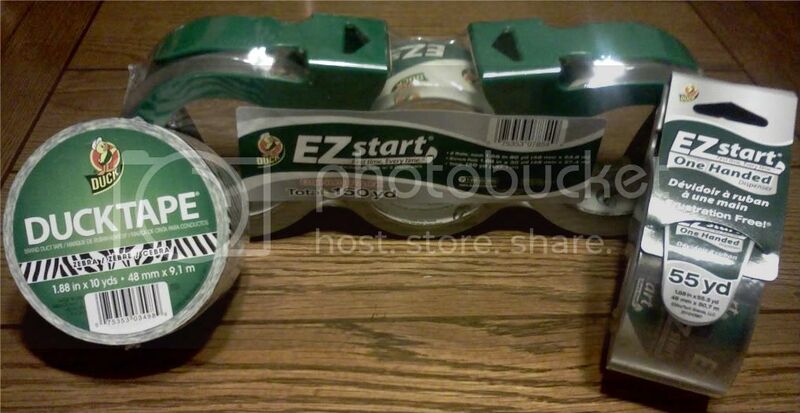 I really liked the Duck EZ Start Premium Packaging Tape w/ Dispenser as well. It was just as easy to use and I didn't have to search the roll for the beginning of the tape because this dispenser had a rolling mechanism that helped keep the tape in place. Duck Tape has outdone themselves with these packaging tapes but I have to say my ultimate favorite in the package was the Zebra Printed Duck Tape! I was giving my daughter a small gift for her academic achievements so I bought the bag for 25 cents and completely transformed it. 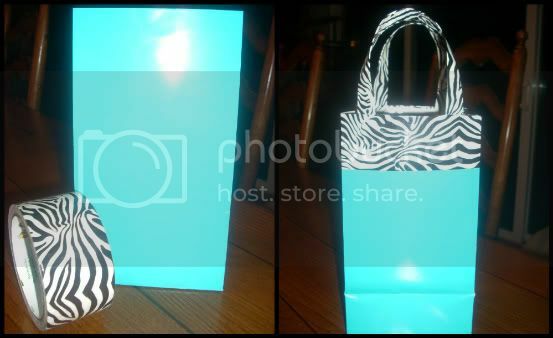 I made the handles using the Zebra Printed Duck Tape by folding it on itself and then I used the Duck EZ Start Premium Packaging Tape w/ Dispenser to attach the handles to the bag. I then wrapped the tape all around the top rim. My daughter loved it and so did everyone else that got to take a look at it.